Find your address on the below map to determine which of our six commissioners serves your district. Contact the Coffee County Elections Office at 912-384-7018 for your ward and commissioner based on your city address. Agendas for City Commission meetings are available online, in the lobby at City Hall, and at the entrance of the Council Chambers prior to the meeting. Following approval, minutes will be posted on the website. This means the minutes may be delayed for 2-3 weeks. 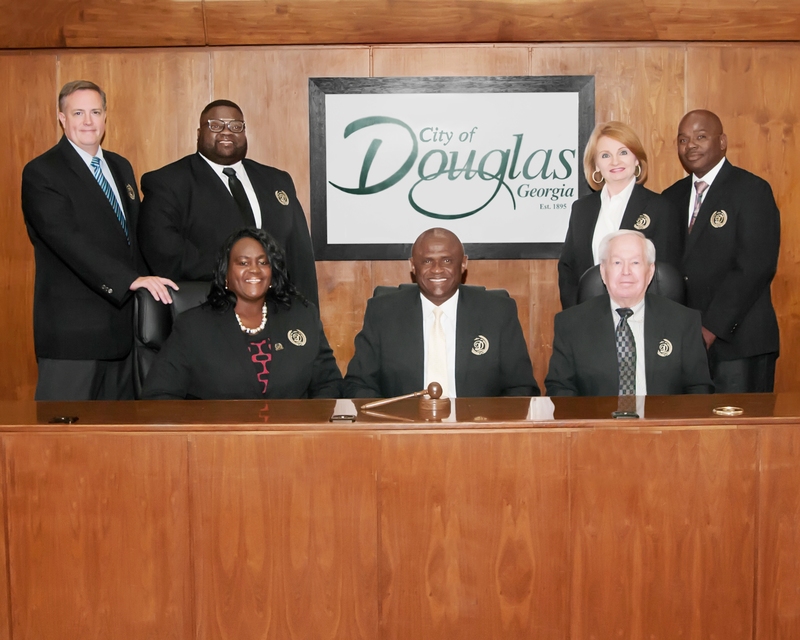 The City of Douglas welcomes citizens to attend and participate in City Commission meetings. When a citizen has a concern or question for the local government, there are guidelines that need to take place prior to the meeting. There is a method in which a citizen may be placed on the City Commission Work Session Agenda – as a person who may speak during general comments which are restricted to three minutes. If a citizen wishes to be placed on the City Commission Work Session agenda under the general comments section, the citizen should notify the City Manager’s office no later than 12noon on the day of the City Commission meeting. Under the general comments section of the City Commission Work Session meeting, the speaking time will be limited to 3 minutes. Greetings citizens of Douglas! I know a lot of you have heard or read about the great news for Douglas and Coffee County, but, before I go in to detail about the upcoming redevelopment project, I also have other fantastic news to share with you that affects our community. Once again, our youth are standing out among their peers. I will talk about the redevelopment after I congratulate Jane Ashley Rowell, who is an 8th grade student in Mrs. Teresa Holliday’s class at Citizens Christian Academy. Miss Rowell is the daughter of Tony and Melissa Rowell and she won the state essay contest and went on to place 24th in the nation with her American Flag Essay. Also, hats off to for Coffee Regional Medical Center EMS, who were recently named #1 EMS in the state for the year! Job well done to everyone! Coming up in May, the City of Douglas has partnered with local agencies and Unison Behavioral Health for a Community Mental Health Fair that will be held May 18, 2019 from 10am-2pm at Central Square Complex. We want citizens and newcomers to Douglas and Coffee County to know that we care and we want to provide effective resources for people in crisis. Offering resources to persons in crisis is especially important in the healing process which includes assistance to person effected and their support system. Take the time to stop by Central Square Complex on May 18th. You never know who may need the information that we are providing to the community. Now, onto to what everyone is talking about! The redevelopment of the old high school grounds. This is going to be a great partnership with the development team. The development team is excited to be part of the Douglas success story and look forward to bringing a great tenant lineup to the community. The first phase of this project will be the addition of Rack Room Shoes, Cook Out Restaurant, Jersey Mike’s Subs, Marshalls, Hobby Lobby, Starbucks, and Chick-Fil-A. The project will also include a trail head for the popular Douglas Trail encouraging fitness in our community. There will be improved lighting at the intersections for vehicle traffic and to aid drivers with better visibility at night. Work has already begun on the site with the demolition of the former Coffee County School Building. Construction is planned to start in the spring of 2020 with the store openings beginning as early as fall of 2020. The development team is working with the City of Douglas to finalize details to make this project a reality. The developers are working with the local government on a finance structure that would allow a portion of the anticipated tax revenue generated by the development to be utilized to offset initial development cost. This structure is a win-win for the municipalities, citizens, as well as the developers. The municipalities get the benefit of additional taxes created by the redevelopment. Citizens will see benefits from the creation of additional jobs, along with an improvement in lifestyle created by the more diverse dining and shopping experience, by only pledging a portion of the taxes generated by the development. Without this type of partnership, this type of project cannot happen. As the Mayor of the City of Douglas, we have an opportunity that does not normally present itself to a city and county that is our size. This opportunity could be the launching pad more major retail development in the city of Douglas. With that being said, grab a cup of coffee or bottled water, this is going to be a great editorial. As a retired military tactical operations command supervisor, I love to name operations. So, I will refer to this operation as “Operation Boom-Boom” because I think this development project has the opportunity to make the community retail market go “Boom-Boom”. This project could be the project that attracts other nationally known businesses such as Olive Garden, Red Lobster, Longhorn, and Cracker Barrel to our smaller community. Now, that is just an example. We are not talking to Olive Garden, Red Lobster, Longhorn, or Cracker Barrel. So, please, no rumors should be started about those businesses. Our community has to prove that nationally known businesses such as Rack Room Shoes, Cook Out Restaurant, Jersey Mike’s Subs, Marshalls, Hobby Lobby, Starbucks, and Chick-Fil-A can survive in smaller markets. I know we can do this! 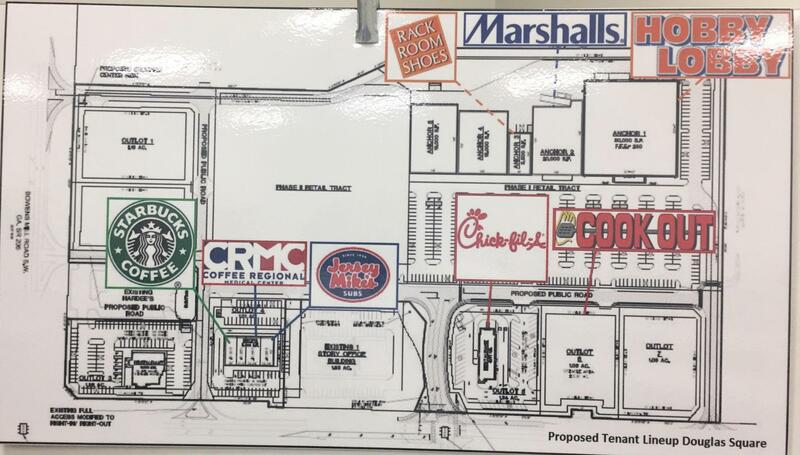 Currently, the developers have a letter of intent from Rack Room Shoes, Cook Out Restaurant, Jersey Mike’s Subs, Coffee Regional Medical Center, Marshalls, Hobby Lobby, Starbucks, and Chick-Fil-A, which will begin Phase 1 of the redevelopment. The aforementioned businesses have agreed to locate in Douglas Square, if the citizens are willing to enter into a public-private partnership. This decision is too big for the Mayor and Commissioners to decide; therefore, a Tax Allocation District (TAD) will have to established and the State of Georgia requires the City of Douglas to put this local issue on the ballot for the citizens of Douglas to decide how to spend tax-payer dollars. If a TAD is established, a portion of the taxes collected in this district will be used to develop the public infrastructure located in the TAD. Since this is a city TAD, the citizens of Douglas will have to vote “Yes” on the issue of establishing TAD on November 5, 2019. The other governing bodies (School Board and County) will have to support the TAD through a joint resolution. Over the past 40 years, the citizens of Coffee County have collected $0 in any type of taxes on this property because the property was owned by the Coffee County Board of Education. The Board of Education is exempt from paying property taxes. The portion of taxes collected in the TAD can be used for infrastructure such as curb and gutter, entry roads, service roads, and utilities. NO taxes will be used for buildings. We already use tax dollars curb and gutter, entry roads, and service roads. For example, in the previous SPLOST, the citizens voted to give the Economic Development Authority over 4 million dollars to get industrial parks “site ready” for future developers. Redevelopment of the property means, the citizens of Coffee County and others, will have the opportunity to enjoy retail businesses such as Rack Room Shoes, Cook Out Restaurant, Jersey Mike’s Subs, CRMC Urgent Care Center, Marshalls, Hobby Lobby, Starbucks, and Chick-Fil-A, as officially announced as the first phase. If the property is not redeveloped, minimum taxes are generated on a vacant lot. Since we are a small community, we have the opportunity to unite to accomplish great things for our community. To attract the list of phase 1 retailors and restaurants, we have to put some skin in the game in the form of a TAD. The TAD could be in effect for 20-25 years. This is a long-term public-private partnership. This is only phase 1 of “Operation Boom-Boom”. The developers are strategically planning that phase 1 success, will attract a national grocer and steak house in Phase 2. 10. Olive Garden, Red Lobster, Longhorn, Cracker Barrel, Rack Room Shoes, Jersey Mike’s, Marshalls, Hobby Lobby, Starbucks, and Chick-Fil-A are not begging to come to our community. Nationally known businesses are not kicking down the doors of City Hall wanting to build in Douglas. The possibility of a TAD has brought developers to Douglas and Coffee County. This is our moment to brightly shine! 11. As the Mayor of the City of Douglas, I promise to present you the information as soon as I receive any updates on potential new businesses. I can only release the names when the developers have secured a letter of intent. I am extremely excited for this opportunity. 12. Developing a major retail area in Douglas has the potential to assist with attracting industries, new physicians, new retail businesses, and expanding our airport opportunities. Again, this is our moment. 13. City leadership has asked the state to allow the City of Douglas to put the TAD on the ballot in November 2019. We are not in a hurry to make a decision. The leadership of our community decided to start releasing information about this opportunity now. We have several months before our community has to make a decision in November 2019. The City of Douglas, EDA, Board of Education, Chamber of Commerce, Ambrose, Broxton, Nicholls, West Green, and County have put the developers in Douglas at the table to bring Rack Room Shoes, Cook Out Restaurant, Jersey Mike’s Subs, Coffee Regional Medical Center Urgent Care, Marshalls, Hobby Lobby, Starbucks, and Chick-Fil-A to our community. As I mentioned previously, this decision is too big for elected officials. Citizens of Douglas, you will have the opportunity to vote for the redevelopment that will bring these Phase 1 stores to our community. To decrease urgent care wait times at Coffee Regional Medical Center, our citizens have to make a decision. To have a cup of coffee from Starbucks, our citizens have to make a decision. To shop Rack Room Shoes, Marshalls, and Hobby Lobby, our citizens have to make a decision. To eat at Chick-Fil-A without driving 40 miles, our citizens have to make a decision. In the near future, I will put out the numbers connected to “Operation Boom-Boom”. As the Mayor, I promise to be straight forward with our citizens, at all times. We cannot not ask the State of Georgia to re-route Interstate 75 near Douglas to assist in attracting nationally known retail businesses. But, we have forward and progressive thinking leadership that creates opportunities for our community. This opportunity is the result of the efforts of the combined leadership of our community. Our citizens have until November 2019 to educate themselves on Operation Boom-Boom and vote appropriately. May God Continue to bless Coffee County and Go Trojans! Follow us, Like us and Subscribe to our social media pages to watch City Commission meetings online as well as stay up to date on City happenings. Which commissioner serves my district?